The zombies cannot be stopped. From the pitch-black holds of pirate ships and the tunnels beneath the war-torn jungles of Vietnam, they rise up. And there's no way to stop them, no corner of the world that's safe from the invasion. Secret government labs, the trendy galleries of New York's art scene, the drawing rooms of nineteenth century England — all become the lair of the living dead in this inventive and chilling collection of horror and dark fantasy tales. 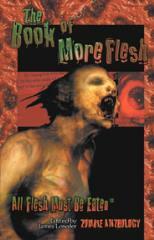 Under the guidance of editor James Lowder, The Book of More Flesh presents more than two dozen original stories, including works from several hot authors as David Dvorkin (The Captains' Honor), J. Robert King (Mad Merlin), Tom Piccirilli (The Night Class) and several more authors whose stories regularly appear in Year's Best collections and on the final ballots for major horror fiction awards.